A charming Beginner Book about a lovable--but sometimes hard to see--lizard by award-winning illustrator Bob Staake! This bright, cheerful easy-reader about a giant lizard hiding in unlikely--and un-lizard-like--places combines Staakes' trademark high-energy graphic style with th... read full description below. 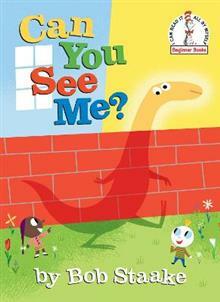 A charming Beginner Book about a lovable--but sometimes hard to see--lizard by award-winning illustrator Bob Staake! This bright, cheerful easy-reader about a giant lizard hiding in unlikely--and un-lizard-like--places combines Staakes' trademark high-energy graphic style with the classic appeal of Dr. Seuss, P.D. Eastman, and Robert Lopshire! With simple rhymed text and illustrations that provide visual clues to the meaning of the words on each page, it's exactly what Dr. Seuss had in mind when he launched the Beginner Books series in 1957 with The Cat in the Hat! BOB STAAKE is the creator of many books for children, including My Pet Book, Bluebird, The Red Lemon (a New York Times Best Illustrated Book), and The Donut Chef (a Children's Choice Book Awards finalist). He's also a prolific and highly acclaimed commercial illustrator whose work has appeared in the New Yorker, Time, the Washington Post, and the New York Times. Find out more about Bob at bobstaake.com.